Due to the rapidly aging population, increasing medical expenditure, and foreign pressure on medical education, Japan is confronting the need for major reform in its medical care system, especially regarding primary care. After our economic stagnation began, the medical expense covered by medical insurance has become a major issue. In spite of our good quality of health care, the Japanese government made a decision to change the health care structure to introduce a GP/FP (General practitioner/Family physician) system and is seriously trying to reform the primary care situation for our context. For those challenges, we have to consider our history of primary care (How did specialists in Japan come to play an important role in primary care different from other countries? ), the development of our medical system (What are the present issues of Medicare with regards to primary care in Japan?) and the approach from medical education (How should we change to nurture primary care doctors with the proper GP/FP training for under- and post-graduates?). Japan must try to keep, develop and deliver effective and good health care for the future through primary care practice reform. The strong desire for the Japanese people after World War II was to reconstruct our nation and catch up with western countries. In 1980’s, during long years of strong economic growth, Japan became a country with one of the longest average life expectancies and highest qualities of health care in the world. However, the development and the present circumstances of primary care are very unique compared with other developed western countries. Primary care and education for primary care have been essential all over the world these days. But the definition of “Primary Care” in Japan is ambiguous, and appears to be different from General Practice in the UK or Family Medicine (FM) in the U.S. This difference comes from the history of medicine and medical systems in Japan. Most primary care in Japan is provided by community-based practitioners at small outpatient clinics or small community hospitals. But they are not the same as GPs or FPs in other countries. Otaki reported on the medical system and primary care in Japan. Though he pointed to the need to introduce a GP/FP system, it has been difficult to apply the system in Japan. Recently, the movement to nurture “genuine” GPs/FPs has become active in our country because of the need to have costeffective medicine and good quality primary care after economic growth turned slow, the increasing aged population, and strong international pressure regarding medical education standards. At present in Japan, the majority of doctors who take responsibility for primary care and its education are not GPs/FPs but organspecialists such as cardiologists or gastroenterologists, or department-specialists such as physicians of internal medicine, pediatricians, or surgeons. In this article, I present an investigation into the history of primary care in Japan, and show and consider the background, present circumstances and problems. Specifically, I approach “Primary Care in Japan” from three aspects: (1) History of Primary Care, (2) Medical System, and (3) Medical Education. When we try to look at the history of primary care in Japan, we should begin at the “Meiji period”, which is around the 1870’s. Before the Meiji period, Japan was governed by a feudal society until the end of the Edo period. In this period, only wealthy people such as high-level samurai families and the imperial family or their associates had their own doctors. These doctors learned medicine which came mainly from China or the Netherlands. Ordinary people were normally not able to see a doctor because they couldn’t afford to pay their fees and could only to look for doctors who volunteered their services. There were several ways to become a doctor in this age. As the examination for a medical license at that time didn’t demand the qualification of graduation from a medical school, there were some private preparation schools for this examination. These later became private medical schools. Also, the descendants or family members of doctors were granted a medical license after a certain amount of training and an examination. At that time, we had a situation whereby doctors who graduated from public medical schools worked at medical schools or big public hospitals, and other doctors worked at clinic-based, so to speak, primary care settings. In the early 1900’s, a big change occurred in which many doctors shifted from medical schools to their own clinics because a number of public hospitals were dramatically closed. This reduction was done by the government because of financial reasons. After that, our unique circumstances developed and accelerated as many doctors opened primary care clinics after several years of organ-specific training at medical schools or big hospitals. And this trend continues even at present with striking similarity. Another reason for the uniqueness of the Japanese system in terms of the history of primary care is that doctors were assigned by medical school departments as human resources in primary care and secondary care settings in communities, in a system known as “ikyoku”(6). Medical school departments such as internal medicine, pediatrics or surgery dispatched doctors to communities to cover primary or secondary care not only in urban areas but also remote areas. Communities had to ask medical school departments for this distribution of doctors to maintain the quality of care in their area. As a result, “Ikyoku” took great responsibility for community health. Therefore, even organ specialists were required to have primary care skills and they actually had to learn them on the job at the health facilities to which they were dispatched. Again, after several years of clinical work as an organ-specialist at university and a primary care giver in the community without the systematic training of a GP/FP, they opened their own clinics such as internal medicine clinics, pediatric clinics or ear, nose and throat clinics. Consequently, unlike western countries, we still have approximately 100,000 primary special (not general) clinics in Japan. They are providing not only special care but also primary care. Thus, a considerable number of patients who have only minor or common diseases are seen at the clinics of specialists. In addition, there is another problem with those clinics. They often have extensive equipment in order to compete with hospitals and to earn their fees. According to a 1995 report, twothirds of these clinics have x-ray machines, and one-third have ultrasonography. There are even many clinics which have CTscans or MRIs in Japan. It is well-known that a large percentage of CT- scans and MRIs in the world are at work in Japan. As a result, it is often said that this medical structure must cost too much, and that this history of development in Japan has affected our society and primary care. National Health insurance in Japan started in 1961, and all Japanese citizens have to join our Medicare system, which usually covers 70% of fees for all standard consultations, examinations and treatments at all health facilities. This means the fees are decided neither by who gives the care (specialist or generalist) nor where the care takes place (tertiary hospital or primary clinic) but only by the contents of the care. In addition, there is a limit to the amount of fees the patients have to pay. The patients don’t need to pay more than an amount determined by their income. This system might allow doctors and patients to do over-examinations or over-treatments. On the other hand, all the citizens can have equal access to medical care regardless of their income or social status. As I mentioned earlier, clinics in Japan are very well equipped and doctors tend to do many examinations. The cost is high but the charge to patients is low. The access to any doctors and any level of care is technically free. (Figure 1) Patients in Japan can choose to go to any specialist without a doctor’s reference, and sometimes with no reservation, and normally don’t need to wait so long (only for hours or a few days, not for weeks or months). 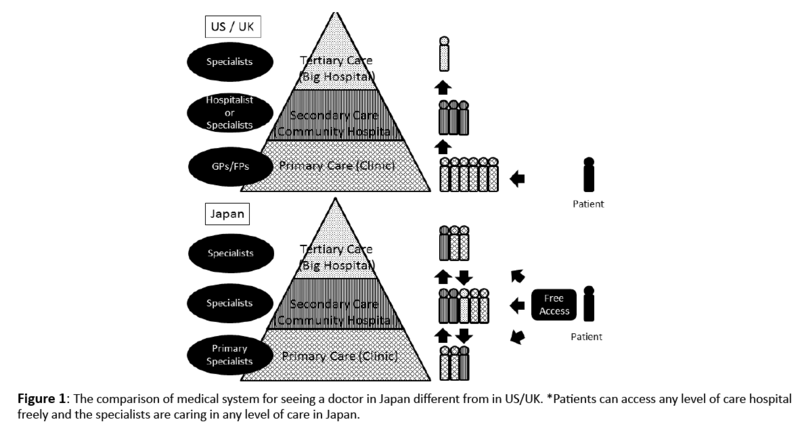 Figure 1: The comparison of medical system for seeing a doctor in Japan different from in US/UK. *Patients can access any level of care hospital freely and the specialists are caring in any level of care in Japan. In other developed countries, GPs play important roles in first contact with patients as gate keepers in primary care settings. But in Japan, if the patients can guess and understand what is wrong with them by themselves, they choose to go and see a doctor whom they want to see. In this situation, the patient could show up not only at primary care settings but also at secondary care, and even at tertiary care settings directly. In terms of doctors’ jobs, doctors in tertiary care settings would like to have more focus on organ-specific care. Specialists tend to be reluctant to look after primary care. But the reality is that even doctors in tertiary care settings sometimes have to take care of patients with common or simple diseases with the same consultation fee. Think about it. If you have a sick child and you have free access to both a GP and a paediatrician, or if you have a problem with your ear and you can choose to see a GP or ENT specialist for the same fee and with no reservation at both tertiary care hospitals and primary care clinics, where would you like to go? If patients have a clear answer for their symptoms, there is no problem. But from the patients’ point of view, they quite often have no idea to which doctors they should go and see when they have unclear symptoms. They might often choose the wrong doctor. It might take a longer time and waste more money to get to the right doctor and the right diagnosis. On the other hand, if they understand clearly what is wrong, they can choose the proper doctor, even tertiary specialist, smoothly and rapidly. There is no clear line between primary, secondary and tertiary care from both doctors’ and patients’ points of view. Those systems are making our conditions of primary care more complicated. At first, let’s look at the medical education for undergraduates, especially regarding primary care. All Japanese medical schools are now facing a difficult circumstance, which is that we have to follow the international accreditation. In Japan, medical students are normally learning on an organ-centered and departmentcentered curriculum. They mainly do department-specific, short-term block clinical rotations in tertiary university hospitals with little chance to see primary care settings. Unless we improve and meet the Global Standards for Quality improvement of the World Federation for Medical Education, Japanese medical graduates will not be able to have clinical training in the US. Many medical schools in Japan need to modify their curriculum to introduce a curriculum of general practice or primary care for undergraduates as well. But the reality is that medical education is still implementing a specialist-centered curriculum mainly in university because we don’t have enough “real” GPs/FPs to teach primary care. Though some medical schools have tried to introduce primary care placement, such as community-based medical education unfortunately those durations are normally only up to 4 weeks, and we cannot say it is functioning effectively enough at present. But there is some good news. Fortunately the number of medical students who would like to become GPs/FPs is increasing according to recent research. Many medical students (14.6%) answered they wanted to become GPs/FPs in the future, which was the third biggest number of all departments. Then, in terms of postgraduate clinical training, there are two aspects involved, namely postgraduate basic training (two years) and GP/FP special training (three years). In the first two years after graduation, interns rotate through several departments. Internal medicine (six months), emergency medicine (three months), and community medicine (1 month) are compulsory now. In this process, there have been many controversial issues of where GPs or FPs will mainly work (clinics or hospitals), or how the organ-specialists who are covering primary care now will be affected. And we still have criticism from related medical societies about the contents of the training for GPs/ FPs and whether the GP/FP culture could even be accepted by Japanese citizens. In fact, the number of GPs/FPs in Japan who officially finished their training is just below 500 as of May, 2015. But the trend for medical education in Japan is definitely shifting to focus more on General Practice or Family Medicine recently in both undergraduate and post graduate education. The circumstances of primary care in Japan are quite unique compared to other countries. It might be helpful to look at the history, the medical systems in Japan and the educational point of view for understanding. Historically, organ-specialists or department specialists have played a very important role in primary care settings in Japan. 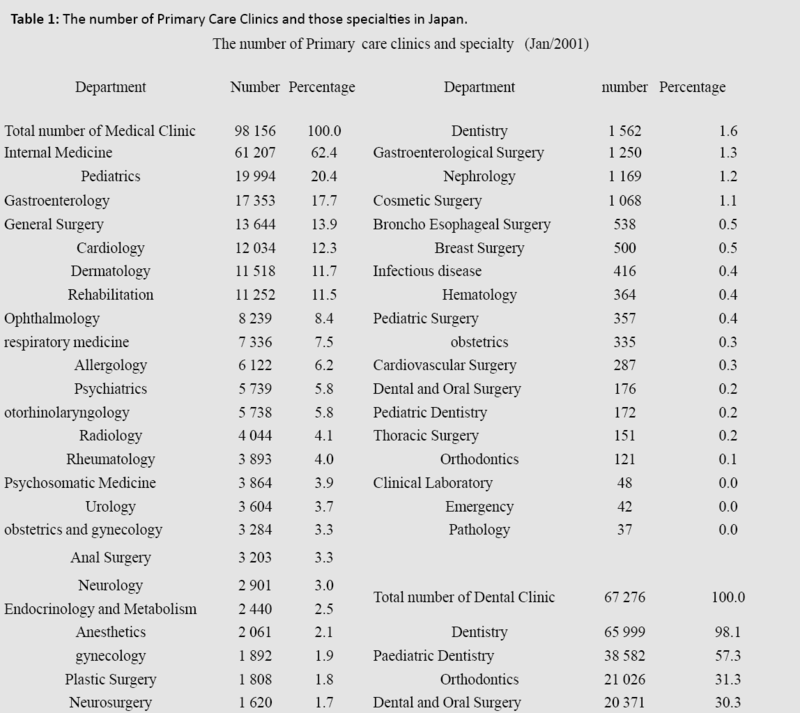 And the majority of primary care clinics are now run by specialists, not GPs/FPs. Our medical systems developed uniquely after the feudal period and achieved very good quality of health care. There are plenty of specialized clinics in Japan (Table 1) and most of them are doing solo-practice without systematic GP training. The Japanese government is trying to introduce a GP/FP system to our context to improve cost effectiveness and provide better community care. Furthermore, in the medical education field, external pressure and world trends are looking to change our primary care education these past few years. Consequently, the circumstance of our primary care is inadequate at the moment. Whilst we have a top level health care among OECD countries, and there are quite a few benefits from our present primary care context, such as the longest average life expectancy, good quality of care and so on, we need more GPs/FPs who have finished a proper program to reduce money wasting and to care for an aged society.12 And when we have enough GPs/FPs and benefit from those doctors in our society, people in Japan might be able to accept this system. We have constructed one of the best health care countries after World War II in our own way. But now we are trying to develop our quality of health care in a mixed way to additionally introduce a GP/FP system. The circumstance in Japan is dependent on whether we can provide a better quality of GP/FP training and whether the Japanese people can accept this system or not in the future. Otaki J. Considering primary care in Japan. Acad Med. 1998; Jun 73:662-668. Howe A. Twelve tips for community-based medical education. Med Teach. 2002; 24:9-12. 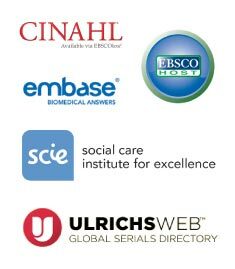 Health and Welfare Statistics Association. Patients and Medical Institutions in Japan: Graphic Review of Health Statistics 1995. Tokyo, Japan: Health and Welfare Statistics Association, 1995. Takamura A, Ie K, Takemura Y. Overcoming challenges in primary care education: a trial of a longitudinal integrated clerkship in a rural community hospital setting in Japan. Educ Prim Care. 2015 Mar; 26:122-6. Teo A. The current state of medical education in Japan: a system under reform. Med Educ. 2007 Mar;41:302-8. Obara H, Siegel BS, Orlander JD. The current state of medical education in Japan: a system under reform. Med Educ. 2007 ; 41: 302-8.